Why would I want an account if I can already listen to songs without logging in to Uvumi.com? * Press Kits - Create professional PDF press kits for your band or solo act, for free! Don't worry, it's very easy to reset your password. Just visit the Password Reset Page and enter your email address. Instructions will be sent to you on how you can quickly reset your account password. How do I set my profile picture? The easiest way to set your profile picture is to go to your Profile Management page, then click the profile picture in the big box at the top of the page. Then, select a photo album, then select the photo you would like to use. That photo will be expanded and the image cropping tool will be loaded so you can cut out the portion of the image you would like to use for your profile picture. Be sure to click the Save button in the preview box to set your profile photo. How can I customize my profile? You may use limited HTML and style markup in your bio to customize your profile. You are also encouraged to provide links to places where fans can purchase your songs and merchandise. Please read Bruce's Tutorials on Uvumi Markup for detailed info on this topic. What markup and styles are supported in my profile, comments, and blog posts? How do I create a band profile? Creating and managing your band is easy on Uvumi.com. Go to your profile management page , click on "Bands" in the left-hand side menu, then click the button called "Create a New Band". You will be asked to provide the band name, which will be used to help you choose the band profile URL (example: http://uvumi.com/bandname). If one of your bandmates has already created this band, Uvumi will attempt to detect that and will give you the option of sending a request to the existing band members to let you join. If you are the first person to create the band profile, then you can just click through and create the band account, which will then take you to the band profile management page so you can invite other members and manage the band's profile just like you manage your personal profile--upload photos and songs, create blog posts, manage albums, fans, etc. If you don't know whether your bandmates have joined Uvumi yet, you can invite them by email address and Uvumi will tell you if they are already registered. If they are not signed up on the site yet, we will send an invitation on your behalf so that they can join the site and be part of your band. If you have questions about this process, please email us for support: support@uvumi.com. Why does Uvumi.com encourage users to register as themselves instead of registering under their band name? Uvumi.com allows you to become a member of multiple bands and to manage those band profiles separately from your personal profile. Many musicians are members of multiple bands, and many are solo artists as well. Uvumi.com embraces the real-world nature of actual social networks among musicians and fans. This approach helps artists gain further exposure by increasing the cross-referencing capabilities of the network. For example, let's say Johnny is a big fan of Band A, and he is especially stoked on the guitarist, Guitarist1. Because each member of Band A has his own personal profile, Johnny can check out Guitarist1's profile, become his fan, and then be automatically notified of any new bands he joins or solo releases he has. This is a win/win situation: Johnny knows more about the music he likes, and Guitarist1 was able to gain further exposure as a direct result of his Uvumi.com profile. Furthermore, you are welcome to use the band feature as a general grouping function. For example, you could run a group blog or photo gallery and invite your writing or photography friends to join you. Feel free to utilize Uvumi.com to meet your unique needs. Uvumi exists to help all artists promote their work and to add value to the entire art community. How do I get featured on the front page of Uvumi.com? Can I disable all commenting on my profile? Yes. Go to your profile about page and scroll down the to "Comments" section. There is a button on the right-hand side of the page that says "Disable Comments". If you click that button other members will no longer be able to leave comments on any part of your profile. This includes your main profile page, your songs, photos, playlists, and events. The exception to this feature is your blog posts. Existing blog posts you have created will retain their initial settings. So if your blog posts all have comments enabled, they will remain this way and you will need to disable comments individually for any blog posts in your account. However, when comments are disabled on your profile, the default setting for new blog posts will be comments disabled. Comments on your profile will disappear when you use the Disable Comments feature. They are not deleted, however, and will reappear if you Enable Comments again later. What happens when I block another user? When you choose to block a user, that user will be removed from your network entirely and will no longer be able to comment on your profile or any of your content, send private messages to you, or become your friend or fan. If there is a user who is harassing you, posting offensive content, or abusing the system in some way, please let us know about it. You can manage your blocked user list on the Network page. How do I stop Uvumi from sending me updates about my account? We try to enhance your experience on Uvumi.com by alterting you when you have new private messages or friend requests. If you don't login for a week and there are updates for you to see on your Uvumi profile, we'll send you a reminder email. If you would like to turn this feature off, please go to your Account Setup page and locate the checkboxes in the "Notifications" section. How do I delete my account? Will you retain any of my songs or photos when I delete them or when I delete my account? You are the owner of your data and therefore you have a right to expect it to be deleted at your request. When you delete a song or a photo from your profile, the actual song or photo data is removed immediately and cannot be recovered. When you delete your account, we permanently delete all of the songs and photos you have uploaded to Uvumi.com. However, any songs that were featured in popularity charts in the past will still be listed in those charts, though they will not be accessible for streaming or even to see the song details as that data will have been removed when you deleted it. Once your profile is deleted, comments you have left on other users' profiles will remain intact but will no longer reference your Uvumi account. You can delete your account by locating the "Delete Profile" box at the bottom of your Account Setup page. How can I easily share songs, artist profiles, and other pages? Does Uvumi.com Have a URL shortener? Sharing is pretty easy, and yes, we do have a URL shortening service! Every page on Uvumi.com has a special button you can click to get a permanent link, short URL, and HTML code to make Uvumi buttons for your MySpace, Facebook, or other pages. You will also find icons you can click to instantly share content on Twitter, Facebook, MySpace, and Stumbleupon. To the left is an example of the share icons inside the player queue window. When you have the queue expanded, these buttons will always be available as long as a song is loaded in the player. Click any one of them to instantly share the current song on one of those four services (Twitter, Facebook, MySpace, or Stumbleupon). Have you ever noticed this little icon before? It exists on nearly every page on Uvumi.com in the black horizontal bar that separates the top of the website from the content area, and if you click it, a window will pop up that contains all kinds of neat info to help you share Uvumi content on other websites. This is how you can quickly access our short URL service, as well as a permanent link to the current page, buttons to quickly share this page on various social network services, and HTML code that you can paste into your other web pages or social profiles to make Uvumi graphics that link back to this page. While it is possible that our streaming media server is overloaded at the moment, this issue could be caused by any number of problems between your computer and our servers. Try reloading the page in your browser and then play the song again. If you still experience a problem, let us know with an email to support@uvumi.com. The easiest way to start creating playlists is to move your mouse over the queue button ( ) of the song you want to add, and choose the "Add to Playlist" option. You can add a bunch of songs to a list this way, then go to your playlist management page to rearrange the songs in each of your playlists. Playlist saving and managing is only available to registered users. There is another way to create and edit playlists. If you have ever used WinAmp 2.x, the Uvumi music player should be very familiar for you. If not, then read on for some helpful tips. 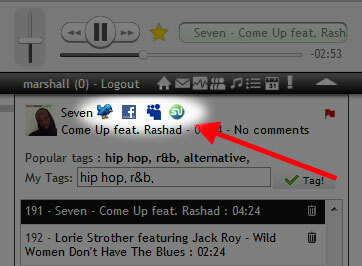 To create a playlist, queue up the songs you want into the music player (look for these buttons on the site: and ). Expand the player playlist by clicking the white tab below the player, so you'll see all the songs you have queued up right now. To save this playlist to your profile, click the save button and follow the instructions that pop up. To manage your saved playlists, go to uvumi.com/profile/playlists and edit, delete, or rearrange songs in your playlists all on one page. What is the little star icon in the middle of the music player? The star icon represents the "favorite" status of the song that you are currently playing. If you click it, that song will be marked as one of your favorites, and you will be able to easily find it on your history page . This is essentially an easy way to bookmark songs that you like. What is the purpose of the Tags? What are "My Tags"? Tags are like votes for which genres a song fits into. You can add tags to any song on Uvumi.com, to help categorize the music on the site and to get an accurate reading of each song's genre(s). This is how we determine which popularity chart each song is eligible for. If more people tag a song as "Rock" than any other genre, for example, that song will be eligible to compete on the Rock chart. We think it's better to let the community determine each song's real genre by entering the genre(s) they think it fits into. Tagging also helps people find music on Uvumi.com by associating interesting keywords with songs. For example you could tag a song "Great Solo" if it has a killer guitar solo in the middle, or "Flute" if the song features a flute. This would enable other people to search for "Flute" or "Great Solo" and find songs which have been tagged with those keywords, which adds value to the entire community by helping to increase the exposure of those songs. How are the popularity charts calculated? Uvumi.com determines which charts a song will be in based on the genre tags associated with it. The more people who tag a song as, say, "Rock", the greater chance that song has to be on the Rock chart. Once a song has enough tags that it clearly falls into one, two, or three distinct genres, the play data is analyzed to determine which songs in that genre are the most popular for the time period that the chart covers. So if a song is tagged as "Rock" and it gets a lot of plays in a day, it has a good chance of moving up on the daily Rock chart. Weekly charts are calculated based on play data spanning the entire week, and monthly charts follow suit as you would expect. How do I tag songs? Song tagging is super easy, and it helps determine which charts each song should be included in. You can tag songs two different ways. When you are listening to a song in the player, you can expand the player queue and add tags to the song near the top of the queue window. Songs can also be tagged directly on the song description page. You can find a song's description page by clicking its title in the player or anywhere it is listed on the site. I pressed a Play button to listen to a song, but nothing happened. Did I break it? No, you didn't break it. And we assure you that we are researching this issue and we hope to find a solution very soon. In the meantime, if this happens to you, we recommend doing a full browser refresh (the F5 button on your keyboard will refresh your web browser). That should reset the music player and get you connected again. We're sorry that it doesn't work in certain instances, and we hope you will bear with us during the Beta phase while we work out these issues and improve the stability of the site. When I use the player's shuffle function on a large song queue, sometimes is stops playing after a while. There is an elusive bug in the player when shuffling a long song queue. The player will fail to play a song, and the Pause button remains visible, indicating that the player thinks it is still working. You can get the player to work again by clicking on another song in your queue, or by pausing, clicking next, then unpausing. Unfortunately we have not been able to solve this issue yet, but we are working on it. Please be patient and accept our apologies for the inconvenience! When I try to play songs I keep getting an error message. Is there a way to fix this? If you get this message every time you try, it might be because your browser session is corrupted or experiencing a technical issue. We have come across this situation during our testing on rare occasions, and it was usually in FireFox after using the same browsing session for many weeks on end. This issue can generally be remedied by restarting your browser, clearing your browser's cache, and in some cases, simply closing the tab and opening Uvumi.com in a new tab. It is possible that this issue is more likely to happen when you use the "Remember Playlist" checkbox in the player queue window. If you experience this kind of problem, please email us with as many details about your experience as you can include, and we will continue working on developing a solution. I tried to play a song/chart/playlist and nothing happened, the red "loading..." box appeared but no music played. What happened? There is a chance that your player was disconnected after a long period of inactivity, or that we rolled out a site update during a period when your session was open but inactive. We are working on fixing this issue, but in the meantime you can get it working again by refreshing your browser. If you experience this problem, we would love to know about it. Please email support@uvumi.com with details about what happened. I uploaded a song and it sounds garbled/sped-up/slowed-down. What happened? For best audio results, uploaded recordings should be encoded at a 44.1kHz sample rate. If your music is encoded at a lower frequency, for example 32kHz, the system will try to resample the audio to 44.1kHz, which may result in your music sounding like it's on fast-forward. Similarly, audio which has been encoded at a higher frequency may sound slowed down after being uploaded to Uvumi.com. If your music sounds garbled, you can try uploading it in a different format (we highly recommend using the Lame MP3 codec). If the encoding is not the problem, there are many recording follies that could cause slightly distorted audio after your music is processed for streaming on Uvumi.com, such as uploading a very low-quality recording, or suffering from phase cancellation due to improper mic placement during your recording session. You also have the option of contacting us to get support with your problem, as we are more than happy to improve Uvumi.com so it supports as many audio formats and flavors as possible, just let us know if you need something specific supported and we'll do our best to make it happen. I'm using the Chrome 3.x and I can't leave comments because the popup box doesn't open completely. This issue has been reported by a small percentage of Chrome users, and continues to perplex us. While we have not found a way to fix this bug yet, we have heard reports of some users solving the problem by upgrading to Chrome 4. If nothing else, we hope you'll consider using FireFox for your Uvumi browsing until we can produce a permanent solution to this problem. I'm using the Chrome or Safari web browser and sometimes the back button takes me way too far back isntead of going to the last page I visited. Why? We believe this is due to a bug in WebKit, though we are not 100% sure. It has to do with unexpected handling of the browser's history stack, and occurs after many page views on ajax-driven websites like Uvumi.com. We are researching possible solutions to this problem, but in the meantime we strongly recommend using FireFox when you visit Uvumi.com. I'm using the Safari web browser and I'm having weird issues that aren't listed on this FAQ page, what should I do? We are aware of some interesting bugs when using Uvumi.com in the Safari web browser, and we have plans to do more extensive testing and debugging on that platform. In the meantime, you might consider trying FireFox instead, as it is an excellent web browser with fewer bugs and issues on sites like Uvumi.com. I tried using Uvumi.com in multiple tabs of my web browser but strange things happened. What gives? Uvumi.com is specifically designed to be run in only one tab or window of a browser instance. If you try opening multiple tabs with Uvumi.com pages, you may experience unexpected results. We strongly recommend that you only run one instance of Uvumi.com per web browser. You will not experience any problems running Uvumi.com in FireFox and Chrome simultaneously, for example. If you do experience specific issues or you're having any problems at all using Uvumi.com, do not hesitate to contact us at support@uvumi.com for assistance. Something is wrong and the site isn't doing what I expected! Why? Uvumi.com is still very new and is maintained by a very small team of geeks. Because of this, there may be bugs or errors in the site that we do not yet know about, or which we have not yet repaired. This phase of a new website is known as "Beta". Beta means the system is fairly stable but is still being tested and may have bugs or unresolved issues that the developers have not yet discovered. We really, REALLY want to make Uvumi.com the best place on the interwebs for artists and bands to promote their work, and we are dedicated to personally helping our users advance their artistic careers. Because of this, we ask that you provide feedback to us when you find a problem with the site or when you have an idea for how it can be improved. We literally consider every suggestion from our users, because Uvumi.com exists to serve independent artists. This is your playground, your free tool to bust out your DIY or professional music, art, and brand development. Make it count, tell us how to make it better! WE WORK FOR YOU! What is the purpose of Uvumi Press Kits? A lot of web services offer "Electronic Press Kits", which are only available online and generally look like very stripped down social profiles. Most providers of EPK tools charge a fee for the service. Uvumi Press Kits are much different, and they are 100% free. Instead of being stripped-down online-only social profiles for artists, they are actual PDF documents with professional layouts that can be distributed online or printed at a professional print shop to create high quality, tangible documents that can be distributed offline. We believe this is much more valuable than yet another online profile page, especially since you already have an Uvumi profile. Also, when you create an Uvumi Press Kit, it will automatically be filled in with as much information as possible from your existing Uvumi.com profile. How can I create an Uvumi Press Kit? It's easy! First, you'll need to register for a new account with Uvumi.com, which you can do on our login page. Then, it's best if you create a full profile with photos, a short biography, songs (if you are a recording artist), past or present tour schedule, and as many other details as you can. Then, go to the press kit management page in your profile, and click the "New Presskit" button. You'll be guided into the setup page for your Uvumi Press Kit. When you're happy with the previews of your UPK, use the "Publish" button to finalize and put it online. If you want to have your Uvumi Press Kit linked from your profile page, use the "Share on Profile" button. You can only share one press kit on your profile at a time, but you can create and maintain multiple Uvumi Press Kits. What do Warnings mean on my Uvumi Press Kit? Warnings can occur for many different reasons on your Uvumi Press Kit. The first warning you will see tells you that you need to choose a template before you can begin working on your UPK. Once you choose a template, Uvumi will try to auto-fill as much information as possible based on your current profile. Oftentimes your current profile data will not fit nicely in the template you have chosen, which will generate various warnings to let you know that parts of your UPK need attention. For example, if your Bio is very long, it will probably overflow onto an additional page in your press kit, which won't look right. This will generate a warning on the Bio section, which you will be alerted to by a red exclaimation icon. Expand each section that has a warning icon and click the preview images at the bottom to see what your press kit will look like. If you Bio is too long, for example, you can edit it to make it shorter, then save the changes to see an updated preview and check for new warnings. Some warnings aren't a big deal. For example, if you have 10 albums in your profile but the template you have chosen only supports five albums, then a warning will appear and the Music page interface will show you which albums cannot be displayed on your press kit. However, if you look at the template you will see that this warning does not affect the final rendition of your UPK, so it can safely be ignored. Be sure to check the preview images of your Uvumi Press Kit so you know what the final document will look like. Once you publish your UPK, always download and view the PDF to make sure it looks good to you. What do I need to know about the different Uvumi Press Kit templates? Each template supports a different number of Songs, Albums, Events, Press Reviews, and Facts. The Bio photo size and Bio length also vary between templates. It's up to you to pick a template that suits your needs, and we try to provide a good variety to choose from. Check out the preview images for each template as you click through the list in the Template setup for your Uvumi Press Kit. When will you release new templates? Why do so many items in my Uvumi Press Kit have this icon and an "Edit" button next to them? And what does the "Default" button do? When you first create an Uvumi Press Kit, we try to use data from your Uvumi profile to fill in the information needed to create your UPK. Items with the icon are synced with your Uvumi profile. This means that if you change that info in your regular Uvumi profile management, it will sync with your press kit. That way, you don't necessarily have to manage two different sets of information (one for your profile and one for your press kit). If you need to override a synced value, you can click the "Edit" button to un-sync that value and change it to anything you want. If you want to revert an item to be synced with your profile again, use the "Default" button. If you change information on your profile that is synced with your Uvumi Press Kit, you will need to republish that press kit on your press kit management page to reflect the changes in your profile. Need help? Email support@uvumi.com. What's up with the preview images at the bottom of each UPK section? The preivew images let you see what each page of your Uvumi Press Kit will look like based on the template you have selected and the configuration you currently have on each page of your press kit. Each time you use the "Save" button to save changes you have made, a new preview will be genereated so you can see the results. Click a preview image to see a larger view of the page you are working on. My Bio/Facts/Music/Press won't fit on one page! Help! If your content is too long to fit on the template page you are working on, you have two options. You can either edit your content to make it fit better on the page, or you can try a different template to see if your curernt content will work better than it is on the template you have chosen. Use the preview images to get an idea of what needs to be edited to make it fit on each page of your Uvumi Press Kit. What if I don't want a Fact Sheet or a Press page? If you don't want to have a Fact Sheet or a Press page, you can delete the items on those pages in your press kit setup. This also works for the Music page. Any page that does not have any content will be omitted from your final Uvumi Press Kit when it is published. You can re-publish as many times as you want, so feel free to try out different combinations or play around with the content on each page until you find a configuration that you're happy with. How can I include copies of my songs in my UPK? If your songs are set to be downloadable in your songs management page, then they will be bundled with your PDF press kit in a Zip archive file after you publish the UPK. Only songs that are marked as downloadable will be included with this archive. How can I include high quality photos in my UPK? The last section of your Uvumi Press Kit is "Photos" and it allows you to upload high quality photos for use by recipients of your press kit. We encourage artists to upload photos they would like reporters, bloggers, and other parties to use in their publications and promotional materials. Photos uploaded here will not be added to your Uvumi profile. You may choose photos you already have on your profile for this feature, but be aware that images you have uploaded to your profile are scaled down by our servers to fit the website layout, and may be too small for use in high quality publications like magazines. When I click on the link to view my Uvumi Press Kit PDF file after publishing, I get a blank page OR my browser crashes OR the PDF file downloads and I can't open it! This usually means that you do not have a PDF reader program installed on your computer. You need to download one of the programs listed below, then try viewing your Uvumi Press Kit PDF file again. There are other PDF reader programs out there that you can try. See Wikipedia's List of PDF Software for more. Something is totally broken on my Uvumi Press Kit and I need help! If you need help with your UPK, please write to us: support@uvumi.com. We are happy to help you get it right and make the most out of this feature.